Among those leading the ASSITEJ Korea International Summer Festival will be performances from Mexico, this year’s featured country. Tumaka’t Danza Contemporanea will be staging two shows, “Brins” and nonverbal performance “Tubos.” Both use dance as their main form of communication. 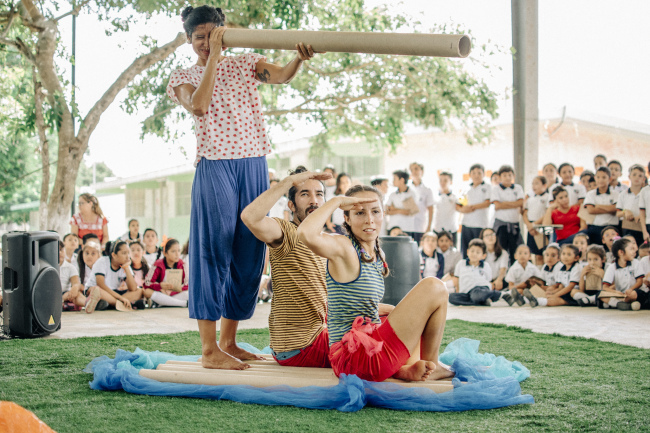 “In ‘Tubos’ we use cardboard tubes to express that the discarded objects can have an unexpected destiny, they will not be destroyed or eliminated, on the contrary, they will redefine their purpose representing new exciting roles,” said Tubos choreographer Vania Duran. Duran added that there is minimal spoken language in “Brins,” with the emphasis on communication through dance. “In Brins, we ‘talk’ about coexistence, tolerance, friendship and feelings like jealousy, fear and happiness, while the four characters interact and create situations the children can identify with since they experience them every day,” she said. The two plays form part of the festival’s Explore and Play section, along with “Inside Out,” a US performance that turns a bedroom into a playground and “Pararittose,” a Japanese performance in Korean in which kids aged 3 and up are invited to take part in traditional songs and games. This year’s festival, the 25th, is being held alongside the Korea-China-Japan Performing Arts Festival for Children, creating an 11-day event and bringing the total number of performances to 14 and participating countries to 11. In the Awaken Your Curiosity section, there will be the Korean play “The Overcoat,” “The Curious Scrapbook of Josephine Bean” by Scotland’s Shona Reppe, which invites children to help solve a series of clues to find the owner of a scrapbook, and “Vera and the Water” from Iceland, an interactive sensory performance for young children. “Sticky Maze” from Australia creates a maze of newspaper and sticky tape that young children can explore themselves, encountering performers along the way. The festival also has a section encouraging children to overcome anxiety and fears. Among them is Colectivo Cuerda Floja’s “Post Mortem,” a puppet show aimed at teenagers that contemplates life and death. The play follows a young man as he struggles to come to terms with his own death. “The love for his wife causes Victor to defy death, so he looks for a way to comfort her in order to free her from pain and to permanently cut off his earthly bonds and thus transcend death,” Colectivo Cuerda Floja’s Ana Herrera and Jose Angel Soto explained by email. They said Mexicans have the ritual of the dead not because they liked it but to remind themselves that life is fragile, and to enjoy life and express love for each other. “We hope they could take a general idea of our Mexican folklore in the issue of death, our stories are not only about dying, (they) are just to make us think to enjoy life all (the) time,” they said. Unlike the other shows in the festival aimed at young children, “Post Mortem” is aimed at children aged 13 and older. Along with festival opener “Dziu the Bird,” it is in Spanish with Korean subtitles. Except for “The Overcoat” and “Pararittose,” the other performances in the festival are nonverbal or in English. The ASSITEJ festival runs from July 19-30 at several venues in Seoul’s Daehangno Theater district. For a schedule of performances, visit assitejkorea.org/english/schedule.php More information on language and the target age of shows is available in the top item of the International Relations section.